The Narcotics Control Board (NACOB) has arrested two Nigerians for attempting to traffic narcotics through the General Post Office in Accra. The suspects, Theophilus Biney, alias Godwin Orji, a. k. a ‘Goody’, 37 years; and Jeff Nnaana-K, 36 years, both resident in Ghana, were picked up by officials of NACOB at different locations for their involvement in an attempt to traffic Methamphetamine, a narcotic drug to The Philippines. 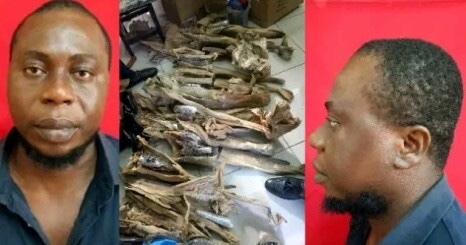 A statement issued by the Communication and Media Relations Unit of NACOB on Thursday, 19 July, said: “Godwin Orji was apprehended after attempting to post the parcels of stockfish which contained 21.7kgs of Methamphetamine. Orji, upon his arrest, admitted ownership of the package when interrogated and revealed that the parcels were given to him by Jeff Nnaana-K to be sent to one Victor, resident in The Philippines.